Author and long-distance horse rider Bernice Ende stands with her stalwart companions from earlier rides: Honor and Claire Dog. Bernice Ende shares a moment with one of her horses while traveling through New Mexico. In 2005 at the age of 50, Bernice Ende mounted her horse and rode south, starting an odyssey that would take her 2,000 miles away from her starting point of Trego, Montana, to Edgewood, New Mexico. The experience that unfolded over the following five months would have been the journey of a lifetime for most people, but for Ende, it was just the beginning. Over the past 14 years, Ende has essentially adopted the life of a nomad, riding 30,000 miles through the United States and Canada. While she still owns a log cabin in northwestern Montana, Ende spends the vast majority of her life traveling with her horses, constantly outdoors, ever on the move. Ende’s life wasn’t always this way. Before her first ride in 2005, Ende grew up on a Minnesota dairy farm, riding horses from the time she could walk. When she grew up, Ende pursued an education in ballet, teaching dance for her entire career. In 1992, Ende moved from the west coast to Trego, Montana, where she opened a small dance school and began giving riding lessons and training horses. “I just suddenly had the realization that I had to move, had to change, had to do something,” she said. Although horses and riding had been a lifelong passion, riding across the country had never been something she’d considered. Until now. As Ende tells it, she saw a window of opportunity open and climbed through. 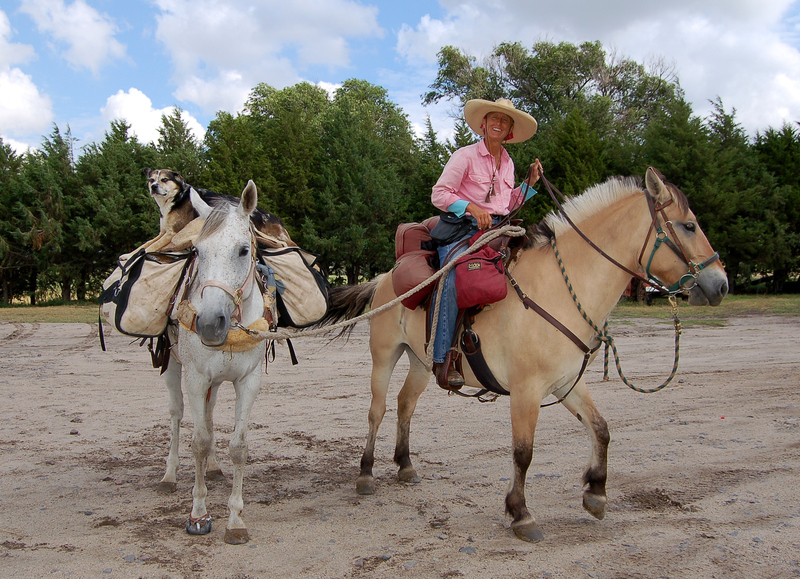 With nothing but her horse and her dog, Ende set off, aiming for New Mexico. The journey was exhausting, both physically and mentally. With a horse determined to return home to the safety of his pasture, Ende felt she couldn’t safely take her hands off the reins. For two weeks, she never let go of her horse. The only way to keep them both sane was to keep moving, so they rode — 30, 40, 50 miles in a day. Ende recalls her legs collapsing when she tried to dismount. She slept in ditches. During the few hours of sleep she got in a night, the only thing that kept her warm was the body warmth of her faithful dog. Ende cried as she rode, often only able to focus on taking one step after another. Yet, eventually, horse and human found an equilibrium. While that first long ride was a challenge from start to finish, Ende rode into New Mexico with the realization that she could never return to normal life. The experience had forever changed her. “It was as if, at 50 years old, I had crawled into my own skin for the first time,” she recalled. Only months after returning to Montana, Ende was on the road again, which is where she has found herself ever since. Many things have changed since that first ride, both in how Ende personally approaches the experience and in the country she is riding through. After 14 years of moving at a walking pace through the country — traveling east, west, north, and south — Ende has gotten a taste of the world she could never have experienced if she had stayed in her “normal” existence. She has experienced both true danger and true kindness on the road, from encounters with grizzly bear and people pulling guns to perfect strangers welcoming her into their homes and greeting her with a hero’s welcome. Perhaps the most surprising realization for Ende is the fact that so many people long for such adventure in their own lives, and how many people she now brings vicariously on her rides. By her own choice, Ende’s life is one different than most. Year-round, she lives outdoors with her horses, sleeping either in a tent or sometimes her horse trailer. Her days are not as simple as riding from one point to another; horses, even those well trained, are still powerful and unpredictable animals. Every moment Ende is riding, she must remain alert to the possibility of something unexpected occuring. While she maintains that the vast majority of her interactions with other humans are positive, Ende does carry a gun for her own safety. As she rides, she navigates her routes along small highways using state maps that she carries with her. The routes she chooses are based on a litany of variables: weather, food, people, and road conditions. In a life stripped to its bare essentials, Ende lives on about $3 a day. Every day she is on the road, her focus is in finding food and shelter. At the end of day, there are often quiet moments, when Ende might find time to read or write in her journal as her horses graze nearby. Yet such freedom always comes at a price. Perhaps the hardest experience Ende has had to face in all her many years of riding has been the loss of some of her longtime companions. Her faithful first companion, a mix-breed dog of unknown origins that answered to Claire Dog, passed away at the age of 16 in 2015 after covering 17,000 miles with Ende. While her first long-distance horse is happily retired on a Montana ranch, Ende lost her beloved second horse to a freak accident. A third horse passed away in retirement, and a fourth horse died of a brain parasite. Through the strong bonds forged after years and countless miles spent together, these are losses Ende will always carry. The gumption that comes from a long line of strong and independent women is part of what has given Ende the inner strength required to stick with her way of life. Ende dedicates each of her rides to her mother, who she describes as a capable woman that always encouraged her daughter to seek adventure. In turn, Ende hopes that in some small way, her own journey will encourage other women to surmount challenges and become strong leaders. Since October 2018, Ende has been on the road traveling once again, this time with a trailer for her horses and boxes of books in her truck as she tours the country sharing her story with others. 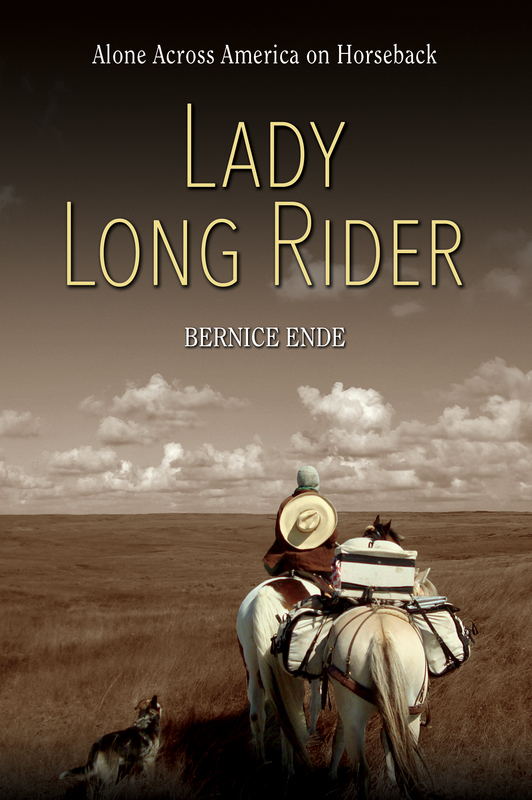 Ende’s eight long-distance rides have become her first book, “Lady Long Rider: Alone Across America on Horseback.” Ende will be visiting the Park Falls Public Library at 6 p.m., Monday, April 8, to tell her story, which will also be the topic of a documentary released later this summer. While Ende’s journey has taken her across the country, it is still far from over. I am developing a writer’s cramp (not really). Truth of it is I am so loving the book tour, although it is more than I had bargained for. This is Deb Dehmer from Rogers, Minnesota. Her family farmed nearby our family farm. I have known her most of my life, used to ride over on my horses, racing fast on soft dirt roads to visit her. Meeting friends I have met on the road is moving enough, but to have these childhood and high school friends suddenly appear is simply touching me with gratitude. A barn which is in remarkably good condition near the Dehmer farm. My oldest sister, Kathryn, who may complain of my putting this on the website. My earliest memories are of her holding me as an toddler and I am screaming and crying and reaching for Spot (the old crippled Welsh pony that embellished our lawn.) Kathryn’s book club came to her home with many questions–a round table of sorts. It was lovely with wine and cheese, and what, 20 women! Sue, she wants little Liska Pearl! Sue and Greg in the front right seats, with family. We had a fish fry–walleye and northern, the best fish I have EVER tasted. Thank you so much Greg and Sue. Oh, so tired, what will they say when we resume travel by hoof and foot? Regardless of a winter reluctant to “give it up already” the birds are glorious in Spring song. The loudest being the Red-Winged Blackbirds! Oh my, oh my, shout it out one and all, shout it out!! Horses resting at the Julie Lambert’s home. Only a hint of green presses out through the brown leafless landscape, reaching for sun and Summer. Rivers and creeks rage with coursing flood waters, “Look out, we’re coming through.” It’s like watching a miracle happen, movement everywhere, winds, water, birds, even people move more freely with discarded heavy winter coats. Welcome to Spring in the Midwest. Casey and Doyle Sandman provided a place for my girls and myself a couple of miles outside of New Ulm, Minnesota, at their Kaboy Up Arena while I spoke at the Community Center in town. Casey greeted me on horseback with a group of other women on a warm, sunny Sunday-afternoon ride. I parked the truck and trailer next to the arena, unloaded the horses, threw a sheet on Spirit and with Liska Pearl in tow we joyfully joined the ride. The other horses were a bit, let’s say disturbed, by the sight of…. “NO, not those Fjords!” For whatever reason, whether its the mane or markings or what, Fjords can easily upset “regular” horses. I smile. My Fjords are rarely upset by anything. Kaboy Up Arena was already busy when I arrived. Besides working as a correctional officer, Casey offers boarding and events throughout the year. A resident trainer offers lessons and training. Busy place, nice atmosphere. I had the “Saloon” to myself–a western style building with restrooms, kitchen, and lounging area. I spent two nights. I rode through New Ulm in 2010, coming up from Texas, having lost Honor. Then, I rode the big paint gelding, Hart. Essie Pearl carried Claire Dog and in we came–escorted by Duane Kitzberger and his team of perfect Percheron draft horses pulling a caisson canon and outriders. Someone tipped him off and they thought it might be fun, to, “Bring her in, in style,” said Duane. This year, I visited Duane, now 84, living in New Ulm’s care facility. I gave him a book and showed him the photos from 2010. Duane in 2010 ready for take off. This is a German Catholic community much like the one I grew up in. The accents are still thick as are the jokes. It has not changed much. Among those attending the talk in New Ulm were folks from Butterfield, Minnesota, with whom I had stayed, in their real-but-renovated livery stable. They were quite the team – Hart, Essie Pearl and Claire Dog. Coming up from Texas in 2010 having lost Honor and little Francis dog. Hard haul up and out of sorrow. I am now in Fairbault, Minnesota, giving a private dinner talk this evening at the home of Julie Lambert. Julie heard about my ride from a friend who lives in Mexico of all things and in a round-about-way invited me in. The horses are comfortable in a large round pen and will be exercised shortly. I have been plied with more food than I can imagine eating while spending a lively evening of talk with new friends. The landscape tenderly wakes from a long Midwest winter. The news is of course about historical flooding and thankfully I made it further north when I did from the Horse Trail Riding Expo in Elkhorn, Nebraska. Thanks to social media Steve Slater reached out and said, “I have a place for you and your horses.” Had I waited another two days I would have had a hard time getting to my talks in Denison, Cherokee, and Peterson, Iowa. Steve taught school for over 30 years and has such a pretty little farm just west of Denison. I can’t thank him enough for putting us up for this extended period while giving three talks in the area and waiting for the weather to settle. Steve and his dog Daisy. When I first arrived last week the rain and wind forced us to put the trailer in Steve’s machine shed. Steve leading Little Liska Pearl to the pasture. Before arriving in Denison, Iowa, I came from the Horse Trail Riding Expo in Elkhorn, Nebraska, just west of Omaha (now flooding). Trail riders stopping by for a book. Colleen Hammer contacted me back in 2010 wanting tips for her long ride which she eventually did, circumnavigating Nebraska with her horse and dog. ALL SMILES both of us!! Despite the weather, the Horse Trail Riding Expo was well attended. I believe this competitive trail sport is a wonderful way to see horse and rider in unity. Training of horse and rider for the showings produce a quiet horse with high maneuverability and trust. Most were young women, not all, but I felt the training and skill went far beyond simply horse and rider. Pleasant and interesting to watch, nice to see how well the animals were handled. The horse and rider face several obstacles–must walk in water, over and under any number of different things like balloons and hanging tarp all set up cleverly, like an obstacle course. I met two Rodeo Queens and one Ms. Junior Queen from North Carolina, and commented to all three how well they carried themselves–they reflected confidence. The event seemed well organized. I certainly enjoyed the three well-attended talks I gave. Thank you Nebraska Horse Trails Committee. This guy, Kent Wassenberg, bought a book and told me his story of how he toured the U.S. with his dog and motorcycle. I visited Nicodemus, Kansas, and Historian Angela Bates at the Nicodemus Visitor Center. Although Angela and I have remained in touch since first meeting in 2006, we have not seen one another since 2008. I tell you two women never scream as much as we do when we get together! Then it’s non-stop philosophical conversation and questions. She is a remarkable woman who saved Nicodemus from extinction and placed it on the National Historic Register, the only remaining town settled by emancipated African Americans. Okay, here we are, Montana Spirit, Little Liska Pearl, and I, with only two more months of the Lady Long Rider Book Tour. This old truck is such a champion. It likes the flat land we can travel at 60 mph! Cruising. I realize now that a ride following this book tour will be impossible. The horses will simply not be ready for such an excursion and I have other obligations with the documentary film coming out. I will return to Montana for a couple of months to take care of the cabin and head back south. Maybe then I will get a ride in this year. Folks at FarCountry Press keeping me in books and encouragement! Thank you, FarCounty, thank you! I head north, a bit reluctantly, but only because it’s still very cold and much snow remains on the ground the further north I go. I am finished with New Mexico’s talks. My “vacation break” in Truth or Consequence’s was much too short. I have completed work with W+E1 Film Productions and now face the second half of the book tour, about 30 talks (I’ve already done 50). I’m looking forward to the many new faces I’ll meet, but also the touching moments when someone from the past, someone I met on a previous ride presents themselves unexpectedly. This happened a week ago in Roswell, New Mexico when I spoke at Roswell’s enormous, newer, very busy public library. I have said it before–the book tour has taken on the feel of a “reunion book tour,” giving me the opportunity of sharing with these people who came into my life with smiles, “How can we help,” food, and encouragement. I’d ridden through Roswell in 2009 on an ambitious 6000-mile ride, riding Honor and leading Essie Pearl with Claire Dog on board–our “dog-and-pony-act rides into town.” Now I find myself ten years later, minus the dog and pony, in Roswell on a book tour. In 2009, I spent five days or so at the Roswell Fairgrounds and met Steve and Cecilia Ortega, who at that time owned a landscape/garden business, and Dale and Kay Rogers who owned (and still do) Roswell Feed & Livestock. One meets many people, but these families were front and center. Steve and Cecilia took me to dinner, brought food out to the fairgrounds, and checked on me daily. Now in 2019, here they were, older after 50+ years together, retired, happy, and such a joy to see again. The Rogers, Kay and Dale, are long-time figures in Roswell. Roswell Livestock and Feed not only provided hay on my stop, but had a worker (whose name we can not remember) who rebuilt and helped design a new doggie box for Claire. Also, Kay and her granddaughter, Desiree, led me on a tour of the town. There was nothing “alien” about Roswell. Another sweet memory from 2009, is when I rode out of Roswell–rested and fed, but the weather remained cold, and Christmas was only a week away. Days are short but steady when traveling in winter months. I’m usually not up and packed until 9 or 10 am. Because it’s cold, I move continuously the entire five to six hours until I stop and set up camp at 3 or 4 pm. A low spot just off the Pecos River east of the small town of Hagerman called out to me. It had an offering of water, enough grass, and shelter from the wind. Okay, we’ll take it, thank you. The horses were on picket lines, tent set up, and my hands wrapped around a cup of hot tea when a pickup truck stopped. A small woman with dark hair, my age, an outdoor working woman–you could tell by the way she came walking toward me–approached. My initial thought… “I’m being evicted.” I did not know I was being rescued! Terry Gomez introduced herself, “No, no you are fine here, my family farm is just over the ridge,” pointing to buildings in the distance. “You know they’re predicting snow don’t you?” “I’ll be fine, I’m from Montana,” my bold, confident voice spoke. We talked a bit more about my rides and where I had come from–the usual talk. Then she left. It’s small but it is cozy and warm. I think what I want most to say in this post is how touched I was by the enduring love in these families. All three couples had been married 50-60 plus years, had aged like fine wine, and had children that supported them in their declining years. In 2009 they simply had no idea how much I needed their help or how hard and alone long riding was. Now I return with a book, but mostly with heart-felt gratitude for what they did for me, my horses, and Claire, which goes beyond words. My heart was touched then by their generosity, and today by the love they spread throughout their families and communities. Gracias!